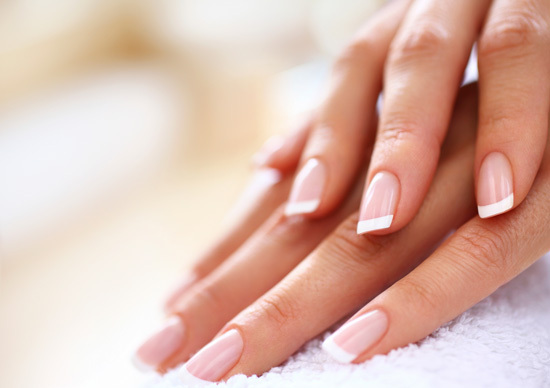 Your hands and feet are overused, abused and require routine maintenance to keep them looking and feeling their best. Treat yourself to a weekly manicure and monthly pedicure and we promise you’ll see and feel the difference. To ensure your comfort and confidence, we maintain the highest level of hygienic sterilization. Our fabulous reclining pedicure spas provide the ultimate in comfort. A soothing yet powerful whirlpool relieves tension while your back is treated to a therapeutic massage. A two week manicure that is all about convenience – no chips, long wearing, with no drying time – Brilliant! Our signature manicure – all the basics plus an exfoliating treatment then hydrating mask with cozy mitts followed by a rejuvenating massage of the hands and forearms. Choice of polish completes this treat. Our signature pedicure – all the basics plus an exfoliating scrub, followed by a hydrating mask and cozy slippers, and a relaxing massage of the feet, ankles and calves leaves you feeling like you’re walking on air. Choice of polish completes this treat. Warm smooth stones massaged then deftly placed transform our essential pedicure into an extraordinary-pedi! A therapeutic hour long reflexology massage followed by an essential pedicure provide the ultimate treat for your feet. Our Essential Pedi plus more time for extra massage. Our Essential Pedi plus more time for extra callus care. NEW! Dream Add-ons for hands and feet! Warm, essential oil infused dip and rub…what could feel better? Don’t leave your tootsies out…same as above…nuff said! Custom blended scrubs and masques to address your specific needs…your hands and feet deserve to dream!